SEN Departments in local authorities in England are currently (or should be) working feverishly on a new "Graduated Response" document aimed at identifying and helping children with special educational needs. In the current system, the graduated response is based on the familiar levels of SEN of School Action and School Action Plus. Then, if after a period of time it looks like a child isn't responding adequately to these increasing levels of intervention, a school or more likely a parent, will seek a Statutory Assessment of the child's special educational needs. Every local authority and every school must have a written SEN policy document. In the county where I live, the current "Graduated Response" document is actually very good and it is set out according to different types of need. When I was seeking a Statement of SEN for my boys, all I had to do was look at the ASD section and note that my children's difficulties easily met the criteria that warranted a statutory assessment. Of course, my very detailed applications were, at first, rejected, but within a short space of time, those decisions were reversed and my sons both got statements without further need to appeal. Of course, it helped that when the Ed Psych turned up, my older son had to be called up from PE, which he loved, and promptly burst into tears, giving her a first hand view of some of his issues. Well done, son! Having had seven years of specialist education, that same boy is now an awesome young man who has just shaved his beard off, Bjorn Borg style, in celebration of the end of his GCSEs and FSMQ Maths. He still has Asperger's of course, but he has had a suitable learning environment and engaged, autism-trained parents to support his needs and this is no more than every, similar child should have. Will this new, improved system make this the outcome for all boys like Son1, without their parents having to seek special educational settings, as we did? Because of course, not all boys like Son1 have parents who are able to advocate for their children as we did. That is, of course, the aim. In fact, I would go as far as to say that is the whole point of the reforms. In the new 'personalised' world of teaching, every child should be identified early enough for interventions to be put into place, before years of rejection, constant reprimand and battered self-esteem take their toll. Taken to the extreme conclusion, the result should be more young people, men in particular, will find their way in life, have better jobs and careers, be better parents, even spend less time in prisons and therefore, break the cycle of troubled families that is perpetuated generation after generation through lack of intervention early enough. Result! And I'm not being cynical. If everything falls into place, this could make a society-changing difference. But back to the present day. We are at the foot of the mountain, where it all starts with the right policies and the right people with the right training, ready to make a difference. Are teachers ready? Do they have a clear idea of what the new system aims to do - not in the bigger picture but at the coalface? I'm not sure they do. The other day, I read a question online from a SENCo asking what the new names for School Action & Action Plus were - the complete opposite of the Department for Education's intentions. These changes aren't the old way in new clothes and unless the DfE get that message across and pronto, we're going to have a bit of a mess on our hands. I'm part of a small group working with the DfE on a document explaining the reforms to parents. I just hope the document that explains the Code of Practice to teachers is ready pretty damn soon so that teachers can read and digest it over summer. The reason why there is little detail in the forthcoming Code of Practice about thresholds and criteria, says the DfE, is because they want to remove as much 'prescription' as possible and give talented and dedicated SENCos more freedom to use the methods that work for their pupils as individuals. This is, of course, Person Centred Planning. And although there will be no Individual Education Plans (IEPs) teachers will still have to keep records, which is where the Buzzphrase "Assess, Plan, Do, Review' comes in. 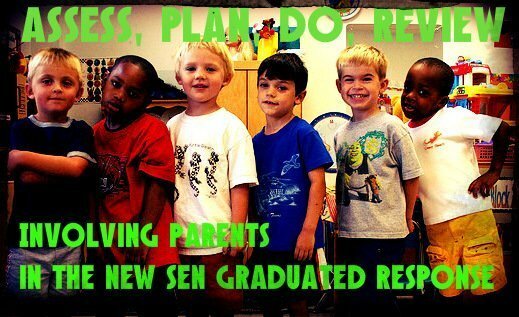 Assess, Plan Do, Review shouldn't really be new as a concept to good teachers and SENCos. It should be what they are doing anyway - identify what the core problem(s) is and plan an appropriate strategy, taking into account how the child learns the best. Then carry out the plan and review how it's working. There are no set number of APDR cycles needed before it's decided a statutory assessment for an Education, Health and Care Plan is required. An EHCP is called for where the need and cost of support to ensure the child's planned outcomes are achieved, can no longer reasonably be met by the school from its own resources. Analysing and quantifying that is a whole other post. The difficulty comes in how to involve parents as partners. Again, some schools may already do this, but in my experience of speaking to parents, this is not generally common practice. In fact, what I hear more often is that parents' views are often taken with a huge pinch of salt - whether it's a parent suspecting a condition such as Asperger's, or their views of what might actually work with their child. This is an opportunity for the teacher and the SENCo to build a collaborative and on-going relationship with the parent. There are two potential difficulties here - firstly, if the teacher/SENCo does not embrace the spirit of the reforms and secondly, if the parent does not want to be involved in this way. Parents reading this are probably engaged and active in helping their child, but there are many parents who either do not want or are not able to participate. As to the unwilling professional, many of us parents have experienced the realisation that the class teacher/SENCo/Headteacher wishes we would just go away and let them "educate" our child as they see fit and that our involvement is surplus to requirements. At the same time, we are just as sure that they have fundamentally misunderstood our child and have no interest in listening to us. Result? Sharpened pencils at dawn. But there is an acknowledgement even among teachers, that NQTs do not have the training needed to be able to implement this new landscape. The video below is by special educational needs organisation, Nasen from a discussion of teachers at a Nasen learning event. These are clearly switched on, committed individuals but, while being positive about the good intentions of the reforms, they raise serious, thoughtful questions about the current levels of training. This video is, for me as a parent, pretty shocking and I thank Nasen and these teachers for allowing their views to be videoed. To emphasise this, they also discussed the earlier point I made about parents who do not want to or are not able to engage - often through fear of being judged. There are just a few weeks left of the current term and the Code of Practice is still a draft - the final version for submitting to parliament for approval is not yet published, although it cannot be far away. The future of our special needs children will be even more reliant on the skills of education professionals to recognise and take action when they see an educational or social deficit in a child. There isn't much time until these changes come into force, although for those children with existing statements, nothing will change until they are moved over to an EHCP at the next transition point or if their statement needs to be updated. There are many challenges ahead, not least for Further Education establishments who are new to the whole thing. If you want your staff or parents to have our training let us know. For those parents who have no confidence that the changes will be embraced by their school leadership, do not forget that every school has Governors - no one should be sitting idly by and waiting to see how it all pans out. Our children are depending on us to work together like grown-ups.